The temizuya at the entrance to the shrine’s innermost grounds is a place to purify the body before entering. Here worshippers wash their hands and mouth with the cool, flowing water in an act of ritual purification. Continuing along the sandō, we come to the temizuya, situated just in front of the last torii gate, where you will find clear, running water. Before proceeding to the haiden, worshippers stop here to wash their hands and rinse their mouths in an act of ritual purification. This is a simplified, abbreviated version of misogi, the full-body purification rite still practiced by devotees. 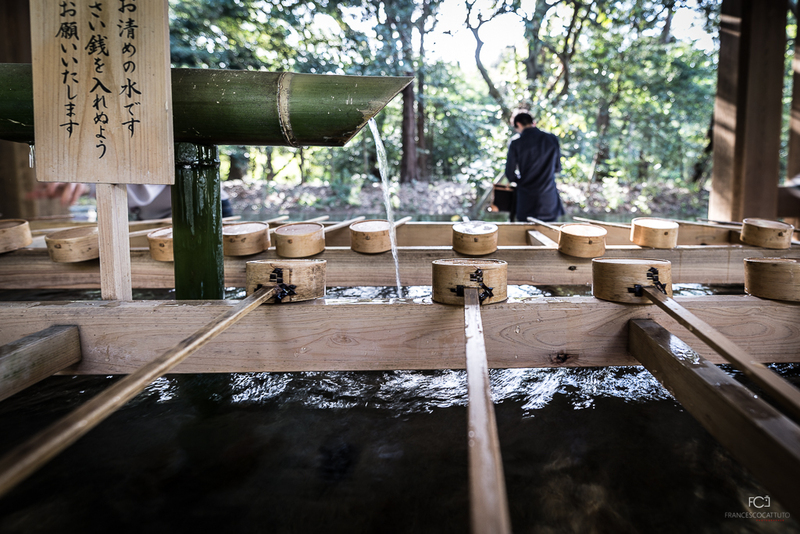 Originally such ablutions were performed at natural springs or waterways within the shrine grounds, and this is still the case at Ise Shrine, where worshippers cleanse themselves with water from the Isuzu River. The entire process should be performed with a single dipperful of water. Taking a hishaku dipper in your right hand, scoop some water from the basin and pour a small amount over your left hand. Switch the dipper to your left hand and pour a little water over your right hand. With the dipper in your right hand, pour a little water into your left hand and use it to rinse your mouth. Once again, pour a little water over your left hand. Then turn the dipper upright so that the remaining water rinses the handle. Finally, empty the dipper completely and return it to its place.